The 23rd Psalm, often called the Shepherd Psalm, is arguably the most loved and memorized pieces of all the Scriptures; almost everyone can recite most or all of its reassuring lines. As familiar as we are with its words, is it possible that we could have missed an important part of what the psalmist David was trying to say? After the opening verses where David declares the Lord is his shepherd, David then makes another series of statements that we might have misinterpreted. Psalm 23:3 is usually translated, “He restores my soul.” In our English tradition, we have taken that phrase to mean that God lifted us from our depression, or he helped us recover a sense of joy and purpose or worth. But was this what David was saying? The original Hebrew words which are translated, “He restores my soul”, are “nafshi yeshobeb.” Nafshi is from the word, ”nephesh” (Strong’s 5315) and means, “myself / soul / person / life.” The second word, “yeshobeb” is an intensive form of ”shub” (Strong’s 7725), the great Hebrew word for repentance (to turn back, to return). 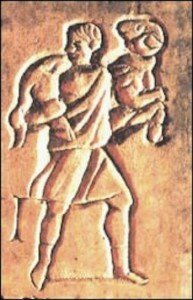 Instead of using the cross, early Christian artists most often depicted Jesus carrying an oversized (indicating a burden) sheep on His shoulders. Could this be the correct interpretation? The phrase in the 23rd Psalm that immediately follows, “He leads me in the paths of righteousness”, adds credence to this idea. The assumption from the story is that the Psalmist was wandering in the paths of unrighteousness when God rescued him. God found him in his lost condition and on the wrong path and picked him up on his shoulders and carried him back to the right path. The good shepherd caused him to repent and return (shub). Could the 23rd Psalm be a story of a lost sheep who God rescues and brings back to the right path? Re-read Psalm 23 reprinted below with this idea in mind and see if it doesn’t bring a fresh and deeper meaning to these words that we know so well. Also, this interpretation wonderfully carries the thread of redemption to yet another place in Scripture. 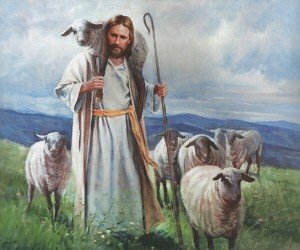 God is the good shepherd and always has His eye on His sheep and will do anything to bring them back to His fold. This is another example of how knowing and understanding the Hebrew language and culture adds another and deeper dimension to our English translations.